It's been a year since the trio of Ed Bolian, co-driver Dave Black, and wingman Dan Huang claim to have driven from New York City to Redondo Beach, California, in just 28 hours and 50 minutes, shattering the famous 31-hour, 4-minute transcontinental record set by Alex Roy in 2006 – and that means only one thing: the statute of limitations has expired, and it's time to release the data. Yes, that's right, there's data – and lots of it. It's in the form of a giant 282-page PDF document created by GeoForce, the GPS tracking firm that was hired by Ed to (unwittingly) keep tabs on his entire run, from start to finish. It lists coordinates and speeds; locations and mileage – 7,832 total data points, spread out over 2,800 miles of driving. Although I first saw it a year ago, right after Ed's record-setting run, I spent some time thoroughly looking over it this weekend to prepare for this story – and I've reached two primary conclusions. Number one: It's a data geek's dream. And number two: It's tremendously incriminating. At multiple points the speed rises above 100 mph and there are numerous instances where it's above 130 mph. In no way is driving that way on a public road safe and — especially for many hours, in shifts, in a car that was essentially a time bomb. And that brings us to the question of: "Why?" More specifically: Why would anyone knowingly break hundreds of laws across dozens of U.S. states, and hire a tracking firm to carefully document the exact position, time, and location every single crime? The answer, according to Ed, is simple: Proof. More people attempt to do this every year than any rational human being could believe, so saying you successfully beat the record on your first run creates an immense burden of proof. "Early teams didn't have any proof," Ed told me, as we talked this weekend about the one-year anniversary of his run and the expiration of the statute of limitations. While the earliest record setters participated in an organized race conceived by legendary racing driver Brock Yates and dubbed the "Cannonball Baker Sea-to-Shining Sea Memorial Trophy Dash," later teams weren't quite as regulated. In a follow-up race, dubbed U.S. Express, the fastest drivers were accused of undertaking a wide variety of antics in order to beat the record – from using planes to move cars across the country to stashing identical vehicles in the western U.S. and flying out to pick them up. That all changed in 2006 with Alex Roy's record. Roy had witnesses at the starting line, witnesses at the finish line, and witnesses along the way. He also had a time clock – punched when he left New York City, flown west, and punched again when he reached the Santa Monica Pier in Southern California. He also used GPS but, given the level of sophistication of the equipment at the time, they had to use eight devices and then tie the different data sources together in one spreadsheet. The technology has gotten better in the intervening years. So, for his own run, Ed took advantage of modern systems and attached a device from GPS provider GeoForce, who didn't realize that they were tracking a record — or so they claimed when Jalopnik spoke to them last year. Taking a quick glance at the data, it's hard not to be either impressed or irate, depending on your perspective. GeoForce, which primarily markets its GPS tracking services to large companies interested in keeping tabs on field equipment, pinged the GPS transmitter in Ed's car every few seconds for the entirety of the trip – from the very beginning ("133 E 31st St, New York, US-NY") to the end ("260 Redondo Beach Way, Portofino, US-CA"). Every single ping records all the data you could ever want: mileage, time, road position, nearest city name, exact latitude and longitude. Speed is what this record is all about – and it is, by far, the most incriminating component of the GPS data. Of course, top speed is one interesting part, as it's impossible to set the record without a seriously fast car. You'll certainly hear that from automotive television host and adrenalin junkie Richard Rawlings, who claimed he hit 200 mph on several occasions while attempting the record a few years ago in a Ferrari 550 Maranello. 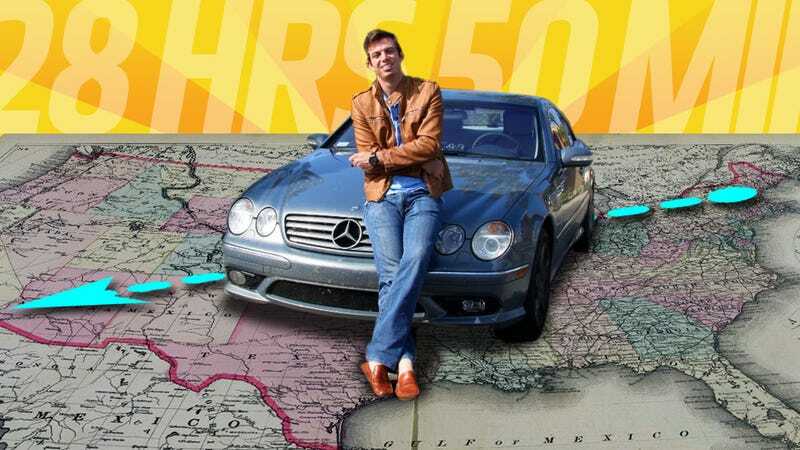 Ed didn't quite go so fast, since his 2004 Mercedes-Benz CL55 AMG is electronically limited to 155 miles per hour. But Ed and company still managed to exceed that limit a few times, reaching a high of 158.26 mph at 5:59 a.m. on Interstate 70 just outside the tiny town of Marshal, Illinois. More interesting than the group's highest possible speed, however, is their sustained speed figures. Although the highest speed limit along Ed's route is 75 mph, the crew spent a whopping 25 hours – or nearly 88 percent of the trip – above 80. They spent 15 hours above 100. They spent four-and-a-half hours above 120. And they spent 96 minutes – more than an hour and a half – above 130 miles per hour. "We think about how easy it is to get on the highway and get up to 130," says Ed. "But it's much more difficult to cruise at that speed for hours." Still, Ed says, the data doesn't show how fast the trip felt behind the wheel, with adrenalin pumping and each of the CL55's occupants keeping a constant eye out for police and traffic. The data also reveals a few other notable points. Take this one, for instance: the crew entered Ohio – a notoriously tricky state for speeders – at 2:21 a.m., with the GPS data showing 405.82 miles travelled. They left at 4:27 a.m., with 631.73 miles on the clock. In other words: Ed and company traversed the entire state of Ohio, east to west, at an average speed of 107.58 miles per hour. Google says the trip takes three and a half hours, but Ed and crew managed it just over two. They only dropped below 81 miles per hour twice. Of course, there are many more shocking numbers contained in the PDF – like the fact that the team managed to pass through the Indianapolis metro area in just 15 minutes, and cross the sprawling city limits of Tulsa in just 16. Ed has posted the entire file on his website for all to see – from the skeptics to the curious; from driving enthusiasts to law enforcement. But because he believes most statutes of limitations expired, Ed isn't especially concerned about police attention anymore. And he's also not too concerned about those who will still doubt the impressive time of his record-setting run, even after he's posted the proof. "There's no proof of doing this that couldn't be faked somehow," Ed says. "Videos can be sped up, pictures can be Photoshopped." So, at some level, you're going to have to look at the data yourself, but with this Ed, Dave, and Dan believe they can claim that they're the reigning transcontinental record-holding champs. For now, anyway. Just a few nights ago, a two-person team in a Nissan GT-R left Manhattan around 10 p.m., aiming to set the bar even higher. Cited for speeding just outside Pittsburgh, they pressed on, undeterred, until their car broke down near Zanesville, Ohio, putting an end to their first attempt. But they'll be back. "I wish them well and congratulate them on putting everything together to make an attempt," says Ed, now a new father with his high-speed antics taking a backseat to a two-month-old son. "Getting to New York and being in a position to try is half the battle."